• Throw out old tires that tend to collect rainwater and make ideal mosquito-breeding conditions. • Discard or empty tin cans, buckets, drums, bottles, wheelbarrows, or any vessel that can hold water. • Fill in or drain any low spots that turn into puddles. • Regularly check drains, ditches, and culverts to ensure they are clean of weeds and trash, so water will drain properly. • Repair leaky pipes and outdoor faucets. • Manage swimming pools or wading pools responsibly; turn plastic wading pools over when they are not in use. 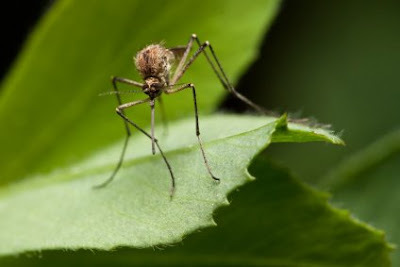 • Keep grass mowed and shrubbery trimmed around the barn and house, so adult mosquitoes will not find refuge there. • Change water in birdbaths regularly so it doesn’t become stagnant, and empty plant-pot drip trays at least once a week. • Keep gutters clean and free of debris and leaves so they drain completely. • Flush fresh water through any barn drains at least weekly. • Clean out and refill watering troughs at least once a week. • Contact your local Extension agent for other suggestions suitable to your particular location. Stay tuned: On Saturday I'll share an easy formula for a safe and effective bug repellent from Organic Body Care Recipes.